Every once in a while, you might come across some videos with audio syncing problems when playing in VLC. In such case, what is your consistent way to handle this trouble? Ditch the video audio out-of-sync files? Or strive to figure out the effective solutions to solve VLC audio syncing problems? Simply, you can fix out-of-sync audio just in VLC media player and that's what we're going to cover here. Honestly speaking, VLC is a wonderful media player for you to tackle audio syncing problems, to some extent. But it's not omnipotent. That means sometimes it might also encounter Waterloo if there is a tough case with audio out-of-sync issue in serious degree. On this occasion, you're advisable to ditch the video and re-download videos from YouTube, Dailymotion, Facebook, etc. with video audio well synchronized. And here the all-round MacX Video Converter Pro is one in a million for you to free download any video music from YouTube, Dailymotion, Facebook, Instagram, Vimeo, Vevo, Myspace, Metacafe, etc. over 300 online video sharing sites in 8K 4K UHD, 1080P FHD, 720P, 3D, Blu Ray video format. 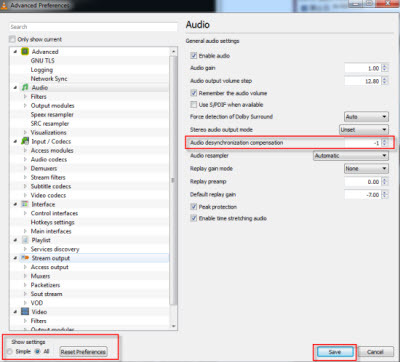 For Windows PC users: press the J or K keys to move the audio back or forward 50 milliseconds, respectively. For Mac OS users: press the G and F keys while the video is playing in VLC. "G" moves the audio forward and "F" delays audio. Here is an Audio delay indicator whose function is to tell you by how many milliseconds you have moved the audio forward or back after hitting the keys. Applying keyboard shortcut to fix VLC audio sync problem is quite simple, right? But things are not always going perfectly. See, using the keys solely allows you to move the audio in increments of 50 milliseconds, remember milliseconds, not seconds. So supposing you wanna move it more precisely, then you'd better to resort to VLC's Preferences. Follow me to fix video audio synchronizing problem in VLC with VLC's preferences. 1Launch VLC and find Preferences from Tools option at the top of VLC interface menu. 2Click "Audio" and select "All" in "Showing settings" area in the lower left corner. 3Find out "Audio desynchronization compensation" after double clicks on Audio and set the syncing compensation forward or backward, depending on how your audio is out of sync with the video. 4Click "Save" and then the VLC audio sync task is finished. You can eventually play the video with video audio in synchronization and finally liberate yourself from the annoying audio out of sync issue in VLC. Generally speaking, applying keyboard shortcut or VLC's preference can fix the usual audio not syncing with video problem in VLC. But everything happens for a surprise. Sometimes, there are also certain cases VLC can't handle, e.g., the original video itself has serious audio delay problem; the audio out of sync problem too severe to fix. In such case, you have no choice but to discard the video and re-download videos from YouTube, Facebook, etc. for smooth playback in VLC. Here the highly acclaimed MacX Video Converter Pro cuts the buck at this point, letting you free download any video music from YouTube, Dailymotion, Facebook, Instagram, Vimeo, Vevo, Pandora TV, Metacafe, etc. 300+ video sharing sites, no matter video formatted in MP4, MOV, AVI, MKV, FLV, or resolution in 720P, 1080P, 4K 8K UHD. How to Free Download Video from Free Online Video Download Sites with Video Audio in Sync? 1Free download this A-list video downloader for Mac and run it on your computer. Copy and paste the online video URL to the box frame. And Click "analyze" button to load the video information. 2Choose an output format, formats, codes, etc. 3Select output folder to save downloaded free videos/movies by clicking "Browse" button. 4Hit "Download Now" to start free online video download progress. And after the online video download process is done, you can also apply this versatile video downloader to convert video to MP4, MOV, AVI, MKV, etc. 180+ video and 14+ audio format in 83X faster speed. One More VLC Tutorial: How to Sync Subtitles with Video in VLC Media Player? On top of the above case of video audio out of sync in VLC playback, you probably would meet video subtitles out of sync problem in VLC. How to fix VLC subtitles not syncing problem? Read on the following dead-easy tutorial. 1Fire VLC up to play video or movie; whilst the video is playing, locate the Adjustments and Effects window by going Tool-Track Synchronization. 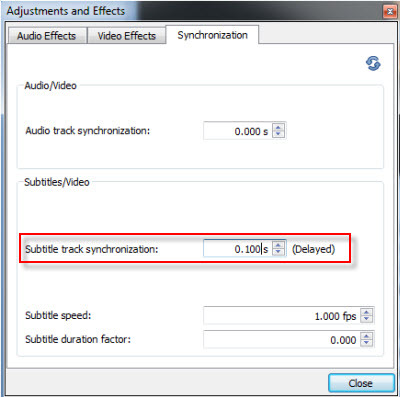 2Followed by "Subtitle track synchronization", increase or decrease the Synchronization of the subtitles based on your own needs. Option: you don't have to use this window; instead, you are allowed to use the keyboard shortcuts G and H to advance the subtitles or bring them back. 3Press "Close" button to end your subtitles adjustment, and then you can eventually enjoy videos or movies with video subtitles in synchronization. VLC Media Player: How Much do You Know about It? 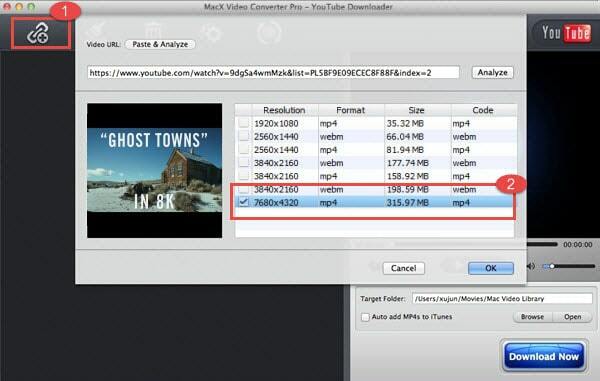 MacX Video Converter Pro is expert in downloading 8K/4K movies/videos from YouTube and other 300+ sites as well as converting the downloaded vidoe to MOV, FLV, WMV and more common video formats.